Cat: Why Was I Banned From U.S.? Puzzled and angry at being barred from the United States, the singer formerly known as Cat Stevens returned to London on Thursday vowing to find out why. 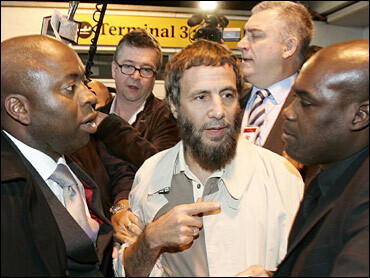 Surrounded by a throng of reporters at Heathrow Airport, Yusuf Islam said it was ludicrous that he was on Washington's no-fly list for having suspected ties to terrorists, and he said he would challenge the decision to block him from entering the country. "Half of me wants to smile, and half of me wants to growl. The whole thing is totally ridiculous," said Islam, whose string of hits in the 1960s and 1970s included "Peace Train," "Wild World" and "Morning Has Broken." He said he was on flight because he was on his way to Tennessee for a recording session. "Everybody knows who I am. I am no secret figure. Everybody knows my campaigning for charity, for peace. There's got to be a whole lot of explanation." Islam, a Briton who was born Stephen Georgiou, abandoned his music career after becoming a Muslim. His United Airlines flight from London to Washington's Dulles International Airport was diverted Tuesday to Bangor, Maine, when U.S. officials reviewing the passenger list discovered he was aboard. U.S. authorities provided few details about Islam's alleged connection to terrorism or when he was added to the watch list. U.S. Homeland Security Department spokesman Brian Doyle said Wednesday the intelligence community had recently obtained information that "further heightens concern" about Islam. A second U.S. government official said on condition of anonymity Wednesday that American authorities believed donations from Islam may have ended up helping fund blind sheik Omar Abdel-Rahman, convicted for a plot to bomb New York City landmarks, and Hamas, a Palestinian militant group responsible for scores of suicide bombings in Israel that is considered a terrorist organization by the United States. British Foreign Secretary Jack Straw complained to U.S. officials Wednesday about their treatment of Islam, telling Secretary of State Colin Powell "that this action should not have been taken," the Foreign Office said. It was unclear whether Straw was referring to Islam's detention or his inclusion on the watch list. Islam, who was traveling with his 21-year-old daughter, Maymanah, told reporters in London that he was bound for Nashville, Tenn., "to initiate some recordings and suddenly we were forced to land and I was being interrogated by officers." His daughter was allowed to remain in the United States. Islam said he was treated well by FBI agents and U.S. officials. "The one positive thing I can say is that a lot security officers are pleased because they got my autograph," he said. "People make mistakes. I just hope they made a big mistake. We'll see." A statement on Islam's Web site said he was seeking further information from U.S. authorities "so that we can challenge the decision to refuse him entry." According to his Web site, the singer was last in the United States two months ago with his record company. During a visit in May, he met with officials of the White House Office of Faith-Based and Community Initiatives, "to talk about philanthropic work," according to White House spokeswoman Claire Buchan.